The blanket centre (without border) measures 31 1/2″ square and required 350 grams of 8 ply (DK) wool @ approx 90m (100 yards) per 50gm. You will need extra yarn to work the border and edging, the amount depends on how large you want your finished blanket to be. 9sts to 5cm over st st on 4.5mm needles. This gauge is after washing so work a largish swatch and wash it first, or block the blanket to the required size after you’ve finished. Lace panels (work these where stated in the pattern). Each pattern repeat is worked over 16 sts. The blanket (as usual 2 versions follow): Cast on 166 sts. Row 1: K15, *work row 1 of lace pattern, K14, rep from * to last st K1. 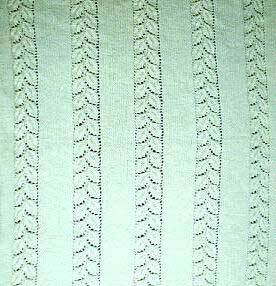 Continue in this manner until you have repeated the lace motif 22 times (220 rows). Place a marker after each 166th st.
Repeat these 2 rows until your blanket is the length and width desired. Repeat row 1 once more. Cast off, working increase at corners. You will need extra yarn if you wish to work a border. Work in lace pattern throughout (no st st panels). This blanket will not be as wide as the first version, but will be as long. CO 31 st. Knit 1 row. Row 1: Sl 1, k3, yo, k2tog, k1, yo, k1, k2tog, p1, ssk, k1, yo, p1, yo, k1, k2tog, p1, ssk, k1, yo, k3, yo, (k2tog, yo twice) twice, k2 – 34 st.
Row 2: K3, (p1, k2) twice, yo, k2tog, p4, k1, (p3, k1) twice, p6, yo, k2tog, k2. Row 3: Sl 1, k3, yo, k2tog, k1, yo, k1, k2tog, p1, ssk, k1, p1, k1, k2tog, p1, ssk, k1, yo, k3, yo, k2tog, k7 – 32 st.
Row 4: K9, yo, k2tog, p4, k1, (p2, k1) twice, p6, yo, k2tog, k2. Row 5: Sl 1, k3, yo, k2tog, (k1, yo) twice, k2tog, p1, ssk, p1, k2tog, p1, ssk, yo, k1, yo, k3, yo, k2tog, (yo twice, k2tog) twice, yo twice, k3 – 36 st.
Row 6: K4, (p1, k2) three times, yo, k2tog, p5, (k1, p1) twice, k1, p7, yo, k2tog, k2. Row 7: Sl 1, k3, yo, k2tog, k1, yo, k3, yo, sl 2 tog k-wise, k1, p2sso, p1, sl 2tog k-wise, k1, p2sso, (yo, k3) twice, yo, k2tog, k11. Row 8: BO 7, k5, yo, k2tog, p7, k1, p9, yo, k2tog, k2 – 29 st.
Row 9: Sl 1, k3, yo, k2tog, k1, yo, k5, yo, sl 2 tog k-wise, k1, p2sso, yo, k5, yo, k3, yo, k2tog, k4 – 31 st.
Row 10: K6, yo, k2tog, p19, yo, k2tog, k2. Repeat these 10 rows until edging is the desired length. Sew to blanket, easing around the corners to fit. Blanket pattern and blanket image on this page are Copyright © Sarah Bradberry April 1996. Edging pattern is in the public domain.